This is a nice one because you really could add this pocket to any pattern. 2. 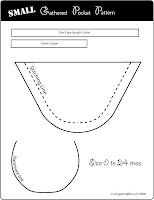 Sew along the rounded edge using a long stitch length and a 1/2 inch seam allowance. 3. Encase the top edge in the bias tape and then top-stitch along the bottom edge of the bias tape making sure that the back bottom edge of the tape is also caught in the stitching. 4. Cut a piece of elastic about 4 inches long. 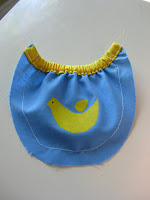 (You can use the pattern as a guide.) 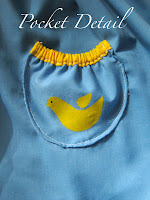 Using a safety pin, insert the elastic into the bias tape casing you have just created. Sew along both ends of the casing to secure the ends of the elastic. 5. 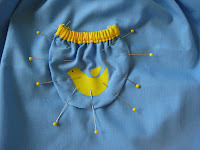 Notch the rounded pocket edge, and then press the edge to the inside of the pocket using the stitched line as a guide. 6. 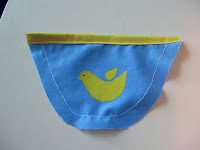 Fold down the corners of the bias tape casing toward the back of the pocket so that the side edge meets the bottom edge. Stitch in place. (This keeps the edges from peaking out on the finished pocket. 7. Pin the pocket to your garment where you want it to go. 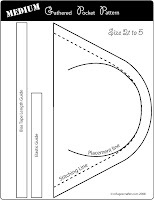 (You can use the pattern below to trace the placement line onto your fabric ahead of time and then use it as a guide for pinning.) Top-stitch along the edge of your pocket. If you expect this pocket to be used rather than just looked at, reinforce the stitching along the top edge. 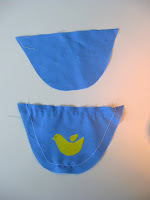 Here are the patterns for the pockets. 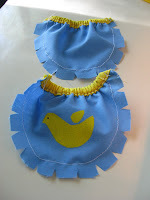 One is a size small (up to 2T-ish) and the other is a size medium (2T to 5ish). Click on the pictures below to download the patterns. You will need Adobe Reader to do so. It's free, and you can download it here. Oooh! Thanks for this. I think its a little over my head but I will take it to my friend to check out. I'm going to start my "attempt" at Ruby Jane's dress tomorrow night. Whew! I'm stressing! Ha! Ha!